This weekend, I finished the second (and hopefully final) Blu-ray release candidate for MindCandy 3. (The DVD-9 is already final.) Some major tweaks involved normalizing the audio across the entire thing, and a minor tweak was to re-encode the main video at a higher quality, so it could grow larger, so it would need to be split across layers, so that the disc is more compatible with old hardware players (it seems that if you’re going to do a layer break on a Blu-ray, it should be in the largest file, as there is apparently a minimum acceptable filesize for the break). The size of the disc grew to about 46GiB, but since a Blu-ray is 46.6GiB, we were still under (by a hair). Considering our premastering tool is highly accurate, and hadn’t shown any errors when I was premastering the project, this was confusing. Fifteen minutes of research didn’t pull up anything concrete other than someone claiming that BD-RE discs take a few hundred meg as “reserve space”, whatever that means. 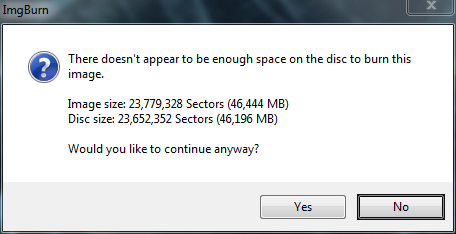 Well look at that: A rewritable dual-layer blu-ray has nearly 1.5 gig less available space than a regular blank. This entry was posted on October 3, 2011 at 7:02 pm	and is filed under Digital Video, MindCandy. You can follow any responses to this entry through the RSS 2.0 feed. You can leave a response, or trackback from your own site.